While the greater part of the gang was out a Gumble for the NSW Long Champs, Darren and Alitia headed up to Brisbane and competed in the Queensland Middle Distance Championships. 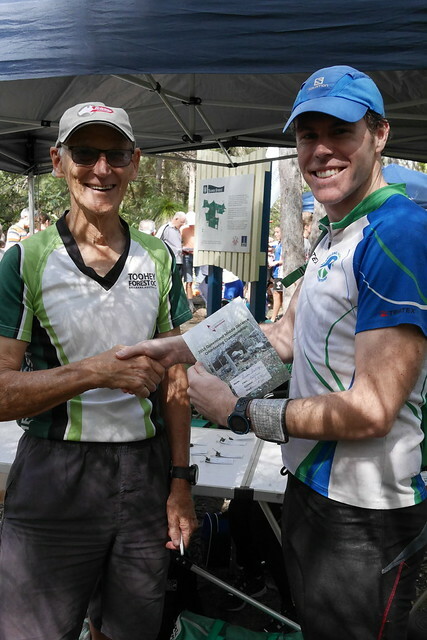 The event was being organised by Alitia's former club, the Toohey Forest Orienteers. The event was at Toohey Forest, behind the Grifith University Campus. Despite being in the middle of Brisbane the map provided a good deal of runnable forest with gullies and sandstone features. Alitia had spent many an evening after school doing terrain reps on this map and was eager to revisit it. Despite the home ground advantage, she was wondering what damage a 10-year hiatus had done. Unfortunately she didn't quote keep up with one of her old competitors, Anna Sheldon but did amicably anyway. Darren, gloating in his victory, took out 1st in M35A. May 2015 Blueprint Out Now! In this issue: Terry and Cheryl's outback trip back from the Aus 3 Days orienteering in SA and comments from orienteers about Bennelong's Gumble Pinnacles map. Read more about May 2015 Blueprint Out Now! The NOSH is back for it's 41st year. Check out the details in full here.